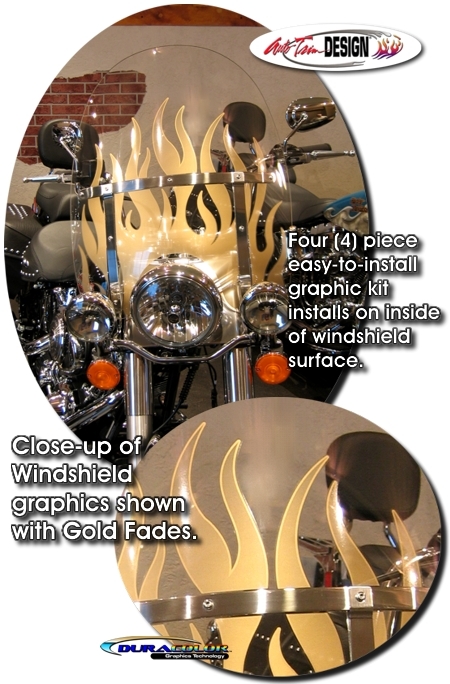 Enhance the look of your bike's windshield with this awesome Faded Flame Graphics Windshield kit. Available in four (4) different colors, this precut easy-to-install four (4) piece graphic kit uniquely fades from solid at the bottom to a light fade at the tips of the flames with a fine outline. While the graphic kit is fit for the Softail Detachable King-Size Windshield as shown, with a little trimming, it can be used on other size windshields as well. Graphic can be installed on the inside or outside of the windshield surface, however an installation on the inside of the windshield affords maximum protection from road debris. Includes easy-to-follow general online instructions. Set you bike apart from the rest today! Please Note: Our Windshield Graphic kits are decorative in nature and look great. However, installation of these graphics may limit vision through the windshield in areas that were once clear. Thus, consider this information and install at your own risk.